This entry was posted in News, plugin, QGIS and tagged plugin, QGIS, REST. Bookmark the permalink. But there are no instructions on what to fill in for those three items. Very frustrating! Would you please help by giving an example? Thanks! The plugin was updated, but it appears to be broken. Well I wasn’t able to figure out how to use the new version either. Here is the old version, unzip and place the folder in QGIS2 (the settings folder) – python – plugins. Like Stu Smith I got nowhere with the current version. 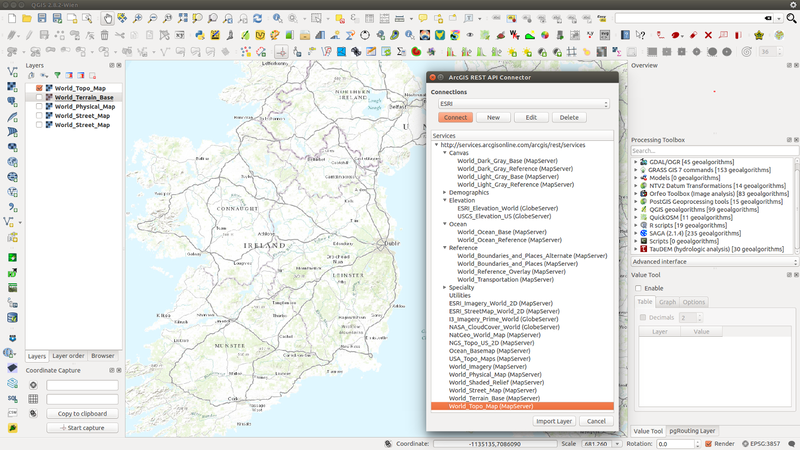 I’ve tried the older version as instructed by bbrhuft – this connects OK but the online services from ESRI no longer seem to provide high resolution aerial imagery. The earlier python script which used to produce high resolution imagery for many months sadly seems to have been discontinued. The OpenLayer plugin which connects to Bing produces a serviceable aerial image (not as high a resolution as the earlier ESRI one) but a big problem is that it cannot be reprojected to a project’s EPGS (or at least it doesn’t for me). Anyone any ideas how to get a similar aerial imagery as the earlier python scripts – or have we just been ‘too good to be true’ for the last few months? I have Just tried to use the ArcGIS RST plugin and when I enter the one of the above URL listed I get the error message ‘the URL points not to a layer’ . Is any one having the same problem? Hi all Any news on how to get this plugin to show Arc maps ? The URL must be a valid path to a “feature service” which can be verified by looking at the URLs above in a browser. There is another caveat: The plugin will probably say that not all features of the layer could be loaded. That’s because the server does not support or enable paging (above servers show a “max. features” set to 1000. In order to see more, you have to zoom in and right-click on layer, chosing reload in the menu entry of the plugin.